For the album by John Hicks, Cecil McBee and Elvin Jones, see Power Trio (album). A power trio is a rock and roll band format having a lineup of electric guitar, bass guitar and drum kit (drums and cymbals), leaving out the second rhythm guitar or keyboard instrument (e.g., Hammond organ) that are used in other rock music bands that are quartets and quintets. Larger rock bands use one or more additional rhythm section to fill out the sound with chords and harmony parts. 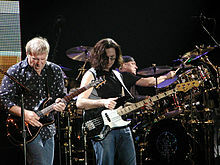 Most power trios in hard rock and heavy metal music use the electric guitar player in two roles; during much of the song, they play rhythm guitar, playing the chord progression for the song and performing the song's important riffs, and then switching to a lead guitar role during the guitar solo. While one or more band members typically sing while they play their instruments, power trios in hard rock and heavy metal music generally emphasize instrumental performance and overall sonic impact over vocals and lyrics. An example of a power trio is Motörhead, which consisted of a bassist, guitarist and drummer, with Lemmy, the bass guitarist, singing lead vocals simultaneously while he played bass. In addition to technological improvements, another impetus for the rise of the power trio was the virtuosity of guitarists such as Eric Clapton, Jimi Hendrix, and Rory Gallagher, who could essentially cover both the rhythm guitar and lead guitar roles in a live performance. In 1964, Frank Zappa played guitar in a power trio the Muthers, with Paul Woods on bass and Les Papp on drums. In 1966, the prototypical blues-rock power trio Cream was formed, consisting of Eric Clapton on guitar/vocals, Jack Bruce on bass/vocals, and Ginger Baker on drums. Other influential 1960s-era blues rock/hard rock power trio bands were the Jimi Hendrix Experience, Blue Cheer, Grand Funk Railroad, the James Gang featuring Joe Walsh, and Taste. Well-known 1970s-era power trios include the Canadian progressive rock groups Rush and Triumph, the American band ZZ Top, the British heavy metal band Motörhead, and Robin Trower. Emerson, Lake & Palmer (as well as its offshoot Emerson, Lake & Powell), while replacing the guitarist by a keyboardist, is usually considered as a power trio, as Keith Emerson fulfilled the rhythm and lead playing on the keyboards that would usually fall on the guitarist, while bassist (and occasional guitarist) Greg Lake was the vocalist. In 1968, the power trio Manal was formed in Argentina, and were the first group that composed blues music in Spanish. 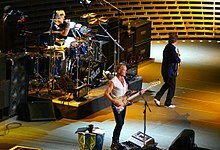 After the 1970s, the phrase "power trio" was applied to the new wave group the Police, grunge band Nirvana, post-punk band Hüsker Dü, mod revivalists the Jam, hard rock/progressive metal band King's X, progressive rock band Rush, post-grunge band Silverchair, alternative bands the Presidents of the United States of America, Goo Goo Dolls, Primus, Everclear, Muse, and Eve 6, pop punk bands such as Green Day, Blink-182, Alkaline Trio and MxPx, and Argentine rock bands like Soda Stereo, Divididos and From Power Project. Also, by the 1990s, rock trios began to form around different instrumentation, from the band Morphine, featuring a baritone saxophone instead of an electric guitar, to Ben Folds Five's replacing the guitar with various keyboards, principally the piano. ^ Larson, Tom (2004). History of Rock and Roll. Kendall/Hunt. p. 183. ISBN 978-0787299699. ^ Watson, Ben (1994). Frank Zappa: The Negative Dialectics of Poodle Play. Quarted Books. p. 26. ISBN 0-7043-7066-2. ^ Gilliland, John (1969). "Show 53 - String Man" (audio). Pop Chronicles. University of North Texas Libraries. ^ Olsen, Andrew. "An Interview with Don Brewer of Grand Funk Railroad". duluthreader.com. Retrieved 12 June 2013. ^ Cariappa, Shiv (January 8, 1997). "Interview With Gerry McAvoy". Christian Science Monitor. Archived from the original on 23 October 2014. Retrieved 22 June 2013. In the late 1960's, two music groups, Taste and Cream, blazed trails as definitive examples of rock's power-trios. ^ UPI (December 11, 1974). "New Rock Music Trio Coming on Strong". The Dispatch. Retrieved 1 June 2013.